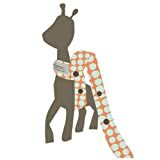 Tutim Nyc Toy Sitter… Perfect for holding onto Sophie the Giraffe”Finally…a solution that is as stylish as it is practical. Keeps toys from hitting the ground when out on a walk and keeps them nearby when indoors”. We lost our first Sophie, and had to buy another. We were traveling and I was going to leave her home. We were not happy about this but did not want to buy a 3rd toy, we found this and it has been AMAZING! I can hook it to the car seat, the stroller or the Ergo! Love Love Love the fact that Sophie does not hit the floor any more! We have had ours in Sophie for over a year now looks great, just wash let dry and put back on Sophie!